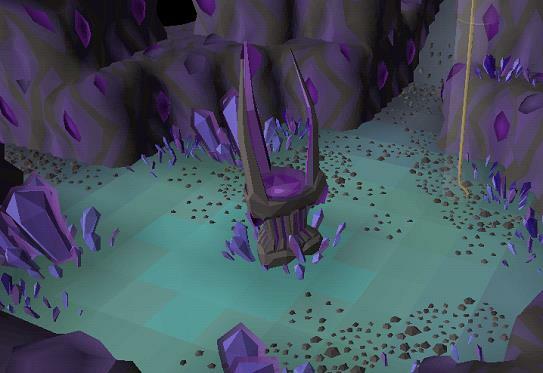 Ancient shards OSRS are items used for quick transportation to different areas which you can farm by fighting monsters in the Catacombs of Kourend. To use them, you have to go to the dark altar in the main entrance of the catacombs. The item expires on use. Most players use ancient shard OSRS to get better stats on their weapon spending as little OSRS gold as possible. You use three ancient shards with a darklight and create an arclight. Arclight is a degradable version of the darklight that has better stats than the abyssal tentacle for fighting demons. You get 1,000 charges from 3 shards and the maximum charge is 10,000. Today, we will give you some tips on how to obtain ancient shard OSRS in the fastest and most efficient way. You can only get ancient shard OSRS in the Catacombs of Kourend where they drop from every monster you kill except for ghosts. To locate the Kourend dungeon you need to go underneath Great Kourend. Easiest way is by using the Xeric’s Heart function on Xeric’s talisman after you’ve completed the Architectural Alliance miniquest. This takes you right outside the statue of King Rada I which you investigate to get to the catacombs. It’s important to remember dwarf multicannon can’t be used in the Catacombs. Drop rate of ancient shard OSRS depends on how many hitpoints the monster you’re assigned has. The best chance for a drop is fighting Skotizo because he always drops 1-5 ancient shards. He’s also the only monster that gives multiple shards on on drop. To access him you need to have a dark totem. If you buy the unlock Bigger and Badder for 150 Slayer reward points, four monsters with an average drop chance of 1/66.66 can spawn. Unlocking the Super Slayer monsters always gives better chances for ancient shards plus they have a 100% drop rate on totem pieces. It’s best to use Protect from Melee against superior monsters because it allows resisting 100% of the incoming damage. At a lower level, it’s best to barrage dust devils or cannon black demons. Hill giants die fast so they often provide quick ancient shards. The Shallows on the southeast to fight King Sand Crabs. This entry was posted in How-To Tips & Tricks, Latest OSRS News, Old School RuneScape, OSRS Mobile App and tagged ancient shard osrs, ancient shards osrs, buy OSRS gold, catacombs of kourend, kourend dungeon, osrs ancient shard, OSRS gold. Bookmark the permalink.